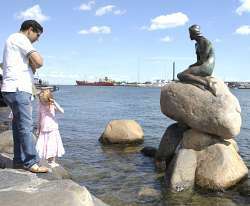 The Little Mermaid has become almost a symbol of the city of Copenhagen. Actually many have been wondering why exactly this small figure should have this unique status. Maybe because of the link to the fairytale of Hans Christian Andersen. Maybe because of her innocent position over viewing the harbour of Copenhagen. Not only is The Little Mermaid among the most photographed motives in Denmark. 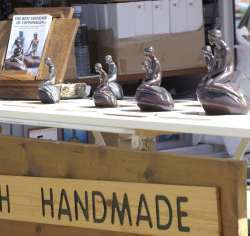 She also is among the most sold souvenirs. What surprises most tourists is the small size. The Little Mermaid is in fact little. The bronze statue is only 165 centimetres high sitting on a natural rock just at the waterfront at Langelinie - Northern part of the Copenhagen Harbour. For at World famous sculpture she is not very old either. The statue is made by the Danish-Icelandic sculptor Edvard Eriksen and was presented in 1913. It was made on the order of Carl Jacobsen (gave name to the Danish brewery Carlsberg). The inspiration for his wish was his joy of seeing the ballerina Ellen Price dancing the ballet The Little Mermaid on the Royal Theatre of Copenhagen. The ballet was written on the basis of the fairytale The Little Mermaid of Hans Christian Andersen. The size of The Little Mermaid is often a surprise for tourists. 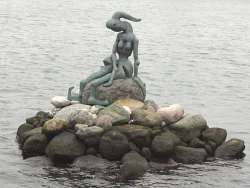 The Little Mermaid is placed on Langelinie which is the preferred place for cruise ships to enter when they visit Copenhagen. I It is North of Copenhagen. In good weather a nice walk along the waterfront from the Royal Castle Amalienborg and even from Nyhavn and Kongens Nytorv. Only a few hundred meters away a newer version of The Little Mermaid is placed. It is called The Genetically Modified Little Mermaid and is made by the Danish artist Bjørn Nørgaard. 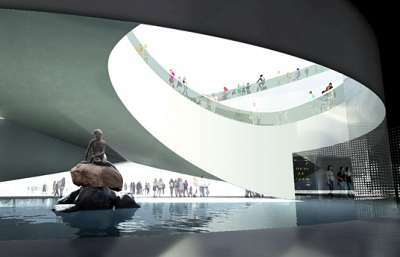 In 2010 The Little Mermaid will be moved to Shanghai to be part of the Danish pavilion at EXPO 2010 in Shanghai. She will be placed in a small indoor lake an stay in Shanghai for six months. At 23rd of august in 2009 the 96th birthday of The Little Mermaid was celebrated by 96 women who were swimming in the harbour shaping the number 96 with their bodies (see video at the bottom of this page). The Little Mermaid in the Danish pavilion at Shanghai 2010 (model photo. 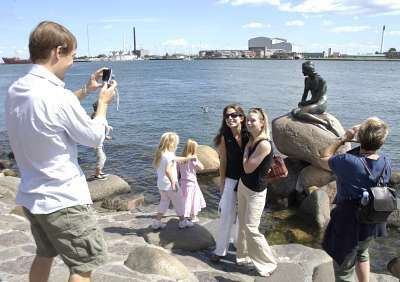 To get a photo of The Little Mermaid is almost a "must" for the visitor coming to Copenhagen for the first time. The Canal Tours of Copenhagen always pass The Little Mermaid on the tour.